Palestinians relish a rare moment of pride and national unity after a 23-year-old wedding singer from a refugee camp in the Gaza Strip wins Arab Idol. Palestinians relished a rare moment of pride and national unity Saturday after a 23-year-old wedding singer from a refugee camp in the Gaza Strip won Arab Idol, a regional TV singing contest watched by millions of people. 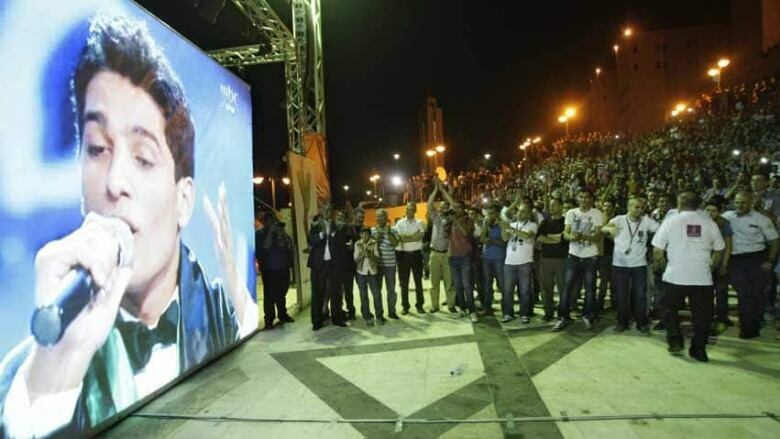 With the announcement of Mohammed Assaf's victory, fireworks lit up the sky over the West Bank and Gaza. Thousands who had watched the final show on outdoor screens in the two territories broke into cheers and chants of "Palestine, Palestine." In Gaza City, young men on motorcycles waved Palestinian flags and women dropped candy from balconies. Rasha Salman, 42, an engineer in Gaza City, was moved to tears. "He brought joy to our hearts and dried some of our wounds," she said. "For a few moments, he united us behind his cause, which is art." The singer with the bright smile and warm voice had put Palestinian pride center stage during the competition. In a performance Friday, many in the audience in the TV studio in Beirut jumped to their feet when he struck up his signature anthem to Palestinian nationalism, "Raise the kaffiyeh." The show, produced by the Saudi-owned MBC Group, was broadcast from the Lebanese capital. Now in its second season, this year's competition began in March with 27 contestants. Assaf, who was born to Palestinian parents in Libya and grew up in Gaza's Khan Younis refugee camp, almost didn't get to compete. He says he had to plead with Hamas to let him leave Gaza, then bribe Egyptian border guards to let him enter the country en route to Lebanon. A fellow Palestinian gave up his slot during the audition phase because he believed Assaf had a better chance at winning. As Assaf advanced in the competition, excitement and national pride kept building in the West Bank, Gaza and east Jerusalem, the territories where the Palestinians one day hope to establish a state. Rooting for the talented performer has allowed Palestinians to feel as one people, forgetting at least briefly their political and geographic split. Gaza is cut off from the West Bank and east Jerusalem, which lie on the other side of Israel. Israeli travel restrictions over the past decade have deepened that separation. Since the Hamas takeover in 2007, Gaza has become more isolated, amid growing animosity between the Islamic militants and Palestinian President Mahmoud Abbas, who administers part of the West Bank. 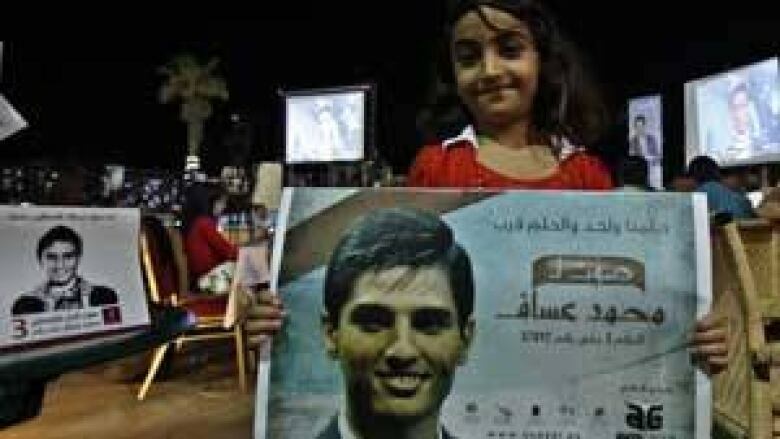 Politicians have tried to latch on to Assaf's popularity. The Western-backed Abbas called Assaf last month to congratulate him on his strong showing and later, in a statement, urged people across the region to vote for the singer. After Assaf's victory, Abbas issued a statement saying that "this is a moment of pride and victory for our people, on the way to achieving the dream of establishing the independent state with Jerusalem as its capital." Hamas at first seemed critical of the Arab Idol fever sweeping Gaza, with a spokesman saying last month that the name and idea of the show are blasphemous. However, Hamas is known for not going against public opinion. In a sign of a shift, a Hamas lawmaker in Gaza, Yehiyeh Moussa, this week praised Assaf as the "ambassador for Palestinian art." Some religious leaders, though, remained harshly critical. Mohammed Salim, delivering a sermon Friday at Islam's third holiest shrine, the Al Aqsa Mosque in Jerusalem, said Palestinians lost sight of their struggle for independence by getting preoccupied with the show. "Voting for songs and immorality, evil and sin is not only forbidden, it is a crime against the cause of our people," he said.